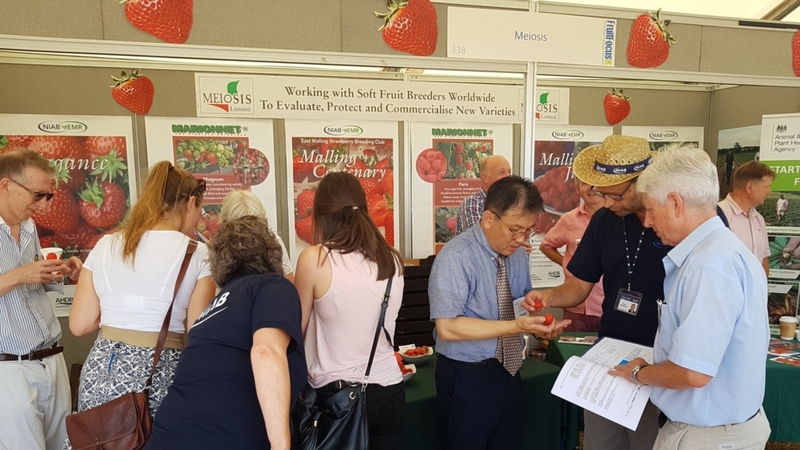 Meiosis attended the annual Fruit Focus event at NIAB EMR at East Malling, Kent, UK on 25th July, where we enjoyed a brisk time meeting friends old and new at our stand. Overall visitor numbers seemed to be slightly down on last year, possibly because of the very hot weather. Our stand was in a different location this year, in a corner near the WET centre, and some visitors commented that they couldn’t find us ! Sorry about that – we’ll ensure that we are easier to find next year. We had fruit samples of MallingTM Centenary (from the EMSBC) and Magnum (from Marionnet) strawberries, and Paris raspberries (also from Marionnet) on the stand for everyone to taste. Fruit of the new EMSBC everbearer MallingTM Champion was also available to try, and we received favourable comments on all the varieties. MallingTM Champion and the new late June Bearer MallingTM Allure will be launched in 2019 but small quantities of plants are already being produced to order – please refer to the variety details on the Meiosis website for the names of licenced propagators. Tony Holden and his team of APHA plant health inspectors shared our stand again this year, and discussed the major pests and diseases of berry crops with visitors, and also provided provided visitors with details of how plant health inspections and certification works in the UK. Dr Mark Else and his collaborators in the WET centre offered very interesting tours and talks on managing water efficiency technologies in strawberry production, which was particularly relevant given the drought conditions being experienced in the UK and many other berry-producing regions. Water saving is not the only benefit derived from the use of these technologies, as plant health, crop yield and fruit quality can all benefit from the precise management of water and fertiliser.